It doesn’t exist yet, but it could with your help. 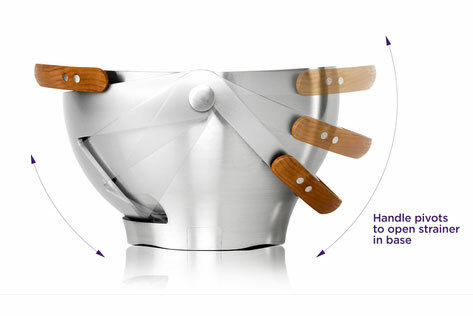 The Ventu Strainer Bowl, a Quirky project is a mash-up between a colander and a serving bowl. For whatever reason, colanders have always enjoyed a reputation as something to avoid in the kitchen–it is just too tempting to try to strain pasta and whatnot with either the lid or a fork. Capitalizing (maybe) on this idea is a project that needs your support. If 1800 people commit to purchasing one, it will exist. While it looks like it would be an elegant solution to a common kitchen shortcut, it appears that it may have some limitations, mainly the concept of it being a wet serving device one would bring to the table. Get around that though with something to rest it in and you got yourself something there. In any event it’s a good idea that only needs a little help. Awesome, can’t wait to get one! A few drips, no biggy, less dishes a HUGE plus!